This is not trick photography. That is an actual, giant, 65-foot-tall, red-piping-hot ball of lava. Here’s what’s happening: From 1969 to 1974, the active Kilauea Volcano on the Big Island of Hawaii was erupting. At the time, the eruption, known as Mauna Ulu, was the longest in the volcano’s history. The US Geological Survey monitored the eruption closely and took a lot of pictures. A few days back, they tweeted out this photo from that eruption, and the internet has been understandably losing its mind. What’s happening in the photo is called a dome fountain. 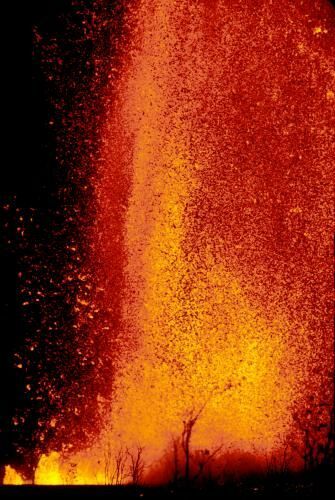 It’s a pretty normal occurrence during eruptions, even if the shape of it is not. When volcanoes erupt, gas and lava spurt through fissures in the earth, and where they come out, they form fountains. Normally, this looks like what you’d think it would — think of a slow-moving river, or a fountain in a golf course water hazard. But this one was special: dome fountains are almost never this symmetrical. What you’re seeing is not an air bubble building up under the lava. What’s happening is that the lava is shooting out of the ground at enough of an angle and with enough force to create this apparently spherical shape. The dark spots are where the air is cooling the outer layer of lava And those ripples you see in front of the dome are not waves: this happened on land. Those are hardened lava flows. The Mauna Ulu eruption was epic — this particular fountain was not even close to the largest. That honor goes to the 1969 fountain that shot 1770 feet into the air. 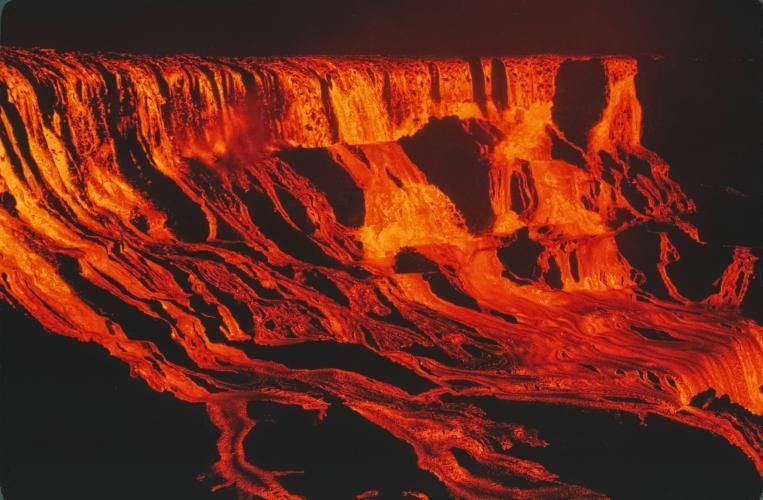 At another point in the eruption, rivers of lava flowed into the ‘Alae crater, creating a spectacular lavafall that, at 330 feet, was higher than the Niagara Falls. The eruption finally ended in 1974, when a giant 7.2 magnitude earthquake caused the summit to partially collapse, ending any eruptions at the volcano for the next three years. By the end of the event, 230 acres of land had been added to the Island of Hawaii. 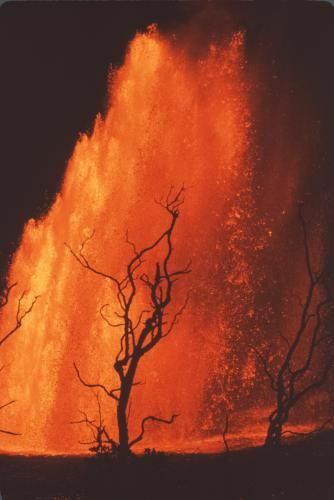 While the Mauna Ulu eruption is over, you can still see volcanic activity at Kilauea if you visit the Big Island: the current eruption now holds the record for longest ever. It started in 1983 and hasn’t stopped.